Garden Welcome Sign - - customized with the garden owner's name. Love to show off your garden? Display this welcoming sign to encourage visitors to 'stop and smell the flowers along the way.' Made in USA. 10" x 3" rectangle sign with radius corners. Made from sturdy and UV-stabilized laminated plastic acrylic with engraved personalization. Sign can hold a name with up to eight (8) 1" characters or ten (10) 3/4" characters. 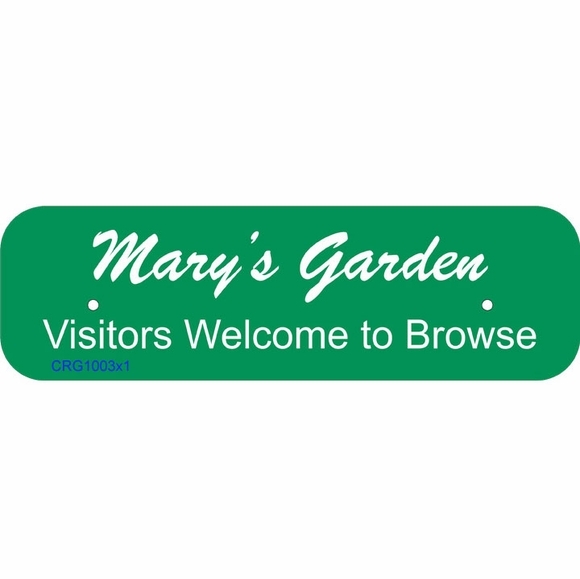 The words "Garden" and "Visitors Welcome to Browse" are standard on all signs. Note: the style number shown in the lower left corner of the sample signs is not printed on your sign. Made to fit our 24" Lawn Stake (click top link in Related Products for details and to purchase the post) or can be mounted on your fence post or wall. If using with your own sign, the sign must have center to center holes between 5" and 7"; the overall width of the mounting plate is 7.5". Comes with two 3/16" mounting holes and stainless steel screws. Note: hole placement designed for corresponding lawn stake holes. Dimensions: 10"W x 3"H x 1/8" with radius corners. Color: kelley green with white letters. Garden Welcome Sign customized with the garden owner's name. Display this custom made plastic sign and encourage visitors to stop and smell the flowers. Made in USA. 10x3 rectangle sign with radius corners.